GPS DEVICES DO NOT PROVIDE THE MOST DIRECT ROUTES. Please follow our directions below for the easiest way to find us. Exit I-25 at exit 278, proceed Northeast on Cerrillos Road approx. 3.5 miles. 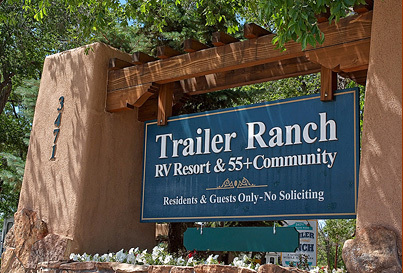 The Trailer Ranch RV Resort is directly across the street from the Holiday Inn Express. 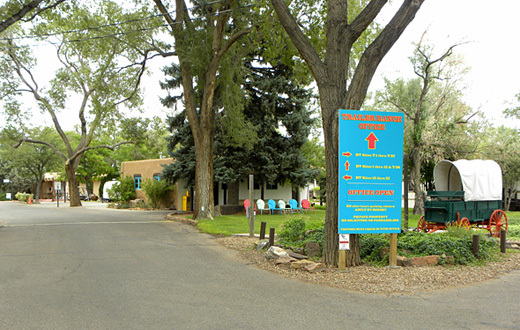 You will turn left into the park, look for big trees, adobe wall, and the blue camping sign in the center median. Closest cross streets are Vegas Verdes Rd. & Avenida de las Americas; we are in the middle of the block. Option 2: Traveling from the North on 285, Highway 285 becomes St. Francis Drive. 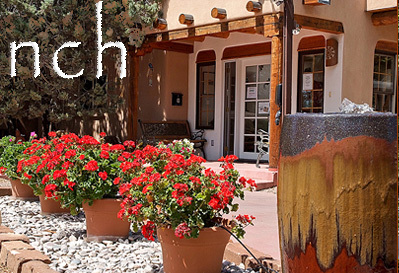 Stay in the right hand lane and turn right on Cerrillos Road. Continue Southwest approximately 3.5 miles. Continue past Home Depot at Richards Ave., past Avenida de las Americas, and turn right into the park in the middle of the block right after the Schlotzsky's. Directly across from Holiday Inn Express. 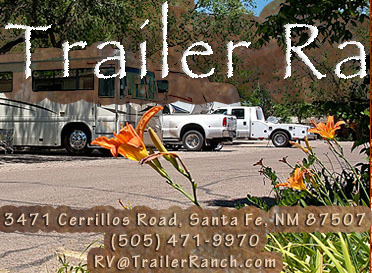 Look for the big trees, adobe wall, and the blue camping sign in the center median. Closest cross streets are Vegas Verdes Rd. & Avenida de las Americas. This route takes you right through the heart of the city.